Why Jailbreak? Freedom? Tweaks? iOS 7 Jailbreak Untethered Tool "Evasi0n Jailbreak iOS 7" will be works for both Mac and Windows, and is considered to be one of the most reliable jailbreaks by the whole community. Some history before iOS 7 Jailbreak: The utility was successful even through 2 iOS upgrades by Apple. Luckily for users, these updates were to fix more serious issues that had arisen on iOS 6.1. However, iOS 6.1.3 put a stop to the jailbreak for anyone who upgraded to it. 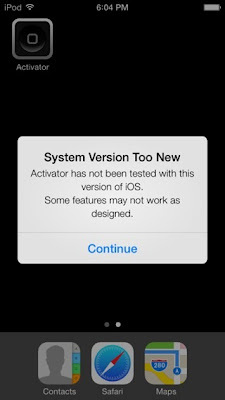 Apple managed to successfully patch most of the exploits that evad3rs had used, thus rendering the jailbreak useless. However, if you have not upgraded your device to iOS 6.1.3 you can still download evasi0n and successfully jailbreak your device. In fact, if you have iPhone 4, 3GS or iPod Touch 4 and you have upgraded, you can use Sn0wbreeze to downgrade your firmware and then carry out the jailbreak using evasi0n. This list will be updated as new versions of Evasi0n iOS 7 Jailbreak are released. iOS 7 Jailbreak Tip: After downloading evasion jailbreak, you will be have to follow the jailbreak tutorial that is very simple to follow . You can use it on your Mac , PC or Linux system to jailbreak iOS 7 in minutes to get the best untethered jailbreak for your device . Can't Wait for the ios 7 Jailbreak! I can not wait to officially come out of iOS 7. To Jailbreak and ja ta coming! September! I have iphone 5 on 6.1.4 will I have to upgrade to IOS 7 to be able to jailbreak? hey will ios 7 jailbreak be there for the ipad mini ???? do u know Evad3rs if apple will bring in ios 7 the flash platform ? 2 years ago they bought a small company who was developing a software for flash ?